Directed by : Ariane Mnouchkine Cooperated by : Asahi Breweries, Ltd. Translated by : Isako Matsumoto Shiseido Co., Ltd. Available from Sunday 27 May, 2001 at 10:00am. ¥8,400 (All seats reserved)(tax included) It should be noted that the hall's regular seats will not be used for this performance. A temporary stage will be set up on the inner stage and temporary seats will be installed on the main stage. As a result, for the convenience of stage direction, entry into the hall or seating will not be allowed 15 minutes after the start of performance. Théâtre du Soleil, which has based in the Bois de Vincennes (Forest of Vincennes), the suburb of Paris, has attracted great public attention in the movement of new European drama since 1964. The legendary company finally is coming to Japan this year. Ariane Mnouchkine, who leads Théâtre du Soleil, has been creating her works that express Western dramaturgy using Oriental dramatic methods, as she has been interested in Asian theatrical arts with her experience of stay in Japan. Her works including 1789, which took its subject matter from the French Revolution, and Shakespearean plays had a great impact on the theatrical world as dramatic events, and they have been successful beyond a kind of drama framework. 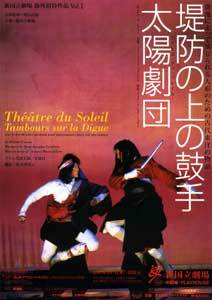 Tambours sur la Digue can be composed of major theatrical essences of the company under some influences of traditional Asian performing arts. Particularly, the remarkable stage direction, which performers play as puppets being manipulated by puppeteers with the techniques of Bunraku (a traditional puppet theatrical form in Japan), is Mnouchikin's homage to Japan. A new excitement will arise from the feeling of seeing players who are both human beings and puppets. This performance can be the greatest topic of drama in 2001, and is highly recommended. One thousand years ago, in China, a large river runs down the middle of a country ruled by Lord Khang and its embankments divide the country into northern and southern parts. There are factories and villages in the northern side of the river, and workers and farmers live there. On the other hand, wealthy people live in the urban areas of the south with prestigious shrines and theatres. However, a fortuneteller prophesies that the river is flooding soon and the world will be end. The Lord has a grief to hear it. If one of the sides is sacrificed, another can be saved. But it can be a difficult decision. As the intentions and expectations of various people are getting involved in conflicts or incidents, the drums are beaten up, signifying the arrival of the flood.